I am supporting David Miliband for Leader of the Labour Party. As an MEP I can make a supporting nomination and will vote in the MPs section of the electoral college. David has the right experience to lead the Labour Party at the present time. As a former Foreign Secretary he understands government at the highest level. Since our task is to win the next election so that we can get rid of the Tories (and the Lib-Dems if they last that long) and govern according to Labour values, it is of the utmost importance to have a leader with first-hand knowledge of governing the country. David is, I believe, the best candidate to take us to victory next time. 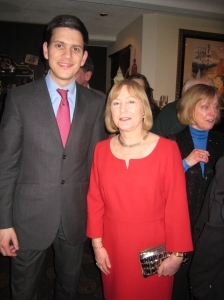 As a MEP I have met with the candidates, seen them give speeches, worked with them on policy and have had a chance to assess their qualities (I’m pictured here with David at a Westminster North CLP fundraiser). Labour is fortunate that we have several talented candidates, and for me David Miliand is the most able. We must also not forget that the Labour Party is the selectorate and we need a Leader who can relate to the wider electorate. On the doorsteps from my campaigning experience David is widely admired and respected by people. Of all those standing he is the one who voters have given me the most positive feedback about. I think it is important the Labour Party selects a candidate who relates well to the electorate. One of the other main reasons I will vote for David is that rights for women is one of the key planks of his campaign. He is committed to looking at the issues preventing women from entering politics and break down those barriers so that women see it as a job for them, a job which suits their lifestyle and their ambitions. He also admits that the long hours culture of the Commons and the adversarial, combative style of Westminster politics are often off-putting as well as the relentless scrutiny of family circumstances which many women are not prepared to expose to the public glare. It’s up to the women in the Party to build on David’s clear commitment to women’s rights. 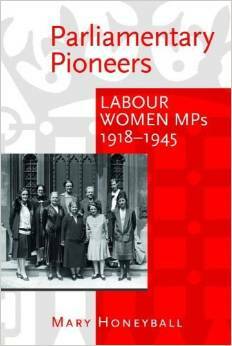 The next Labour Government should put women at the forefront of its policy programme. We must be aiming for improvements in childcare and maternity and paternity leave and pay, to name but a few key matters, especially since many of the gains made for women will be eroded under the Con-Lib-Dem Coalition. In the absence of a credible woman who will get the requisite number of nominations to stand as Labour Leader, David Miliband is the candidate who will do the most for women. As many of you will know, I did not support the war in Iraq and was vocal at the time in my opposition. However, I believe we should now move on from this stain on our record and look to the future. David Miliband is the man for the future, the person I believe will be our next leader. I am pleased that the contest so far appears to be friendly, conducted on the basis of reasoned argument. This must continue. We must, at all costs, avoid a return to the internecine strife of the 1980s which kept us out of power for 18 years. Once the Con-Dems honeymoon is over and their public expenditure cuts realy start to bite, I believe people will return to Labour, a Labour Party with David Miliband at its head. Personally I think it is wrong that potential candidates like Diane Abbott and John McDonnell cannot stand if they fail to get MPs’ nominations, when thousands support them in the wider movement. MPs should be accountable to the wider sentimant of the movement. I shall be spoiling my personal paper by writing in Jon Cruddas. I shall consult with my union branch (Unite), about which candidate I support. I think Harriett has borne hersel well as Acting Leader. We should not forget though, that he chose to spend our hard-earned tax on doing up his home with £9,000 on his kitchen, £6,000 on garage doors, a hand-crafted chair, a goose-down duvet and a sofa. There was also his failure to confirm that he had paid another MP for personal accountancy advice. I think that the ballot should have people like Andy Burnham and Diane Abbot on it; if it did, I would even think of rejoining Labour…. By the way, political office is a public trust. I wouldn’t deem to lecture you on it, because you seem to be quite successful at it, but the lifestyle and ambitions of people in it are neither here nor there. It shouldn’t be a ‘job’ and its characterisation as one is near the heart of our public problems.